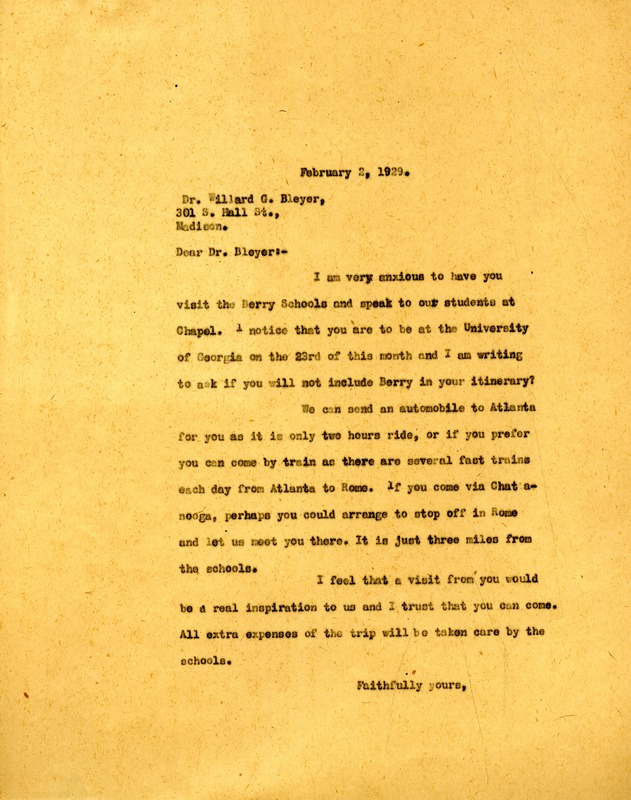 Martha Berry asks Dr. Bleyer if he might be able to speak at Berry while he visits the University of Georgia. She notes several ways that he could get to the school and notes how important a visit from him might be for the students. She explains that all of the expenses of the trip would be taken care of by The Berry Schools. Martha Berry, “Letter to Willard C. Bleyer from Martha Berry.” Martha Berry Digital Archive. Eds. Schlitz, Stephanie A., Chelsea Risley, Aaron Jackson, et al. Mount Berry: Berry College, 2012. accessed April 21, 2019, https://mbda.berry.edu/items/show/9568.